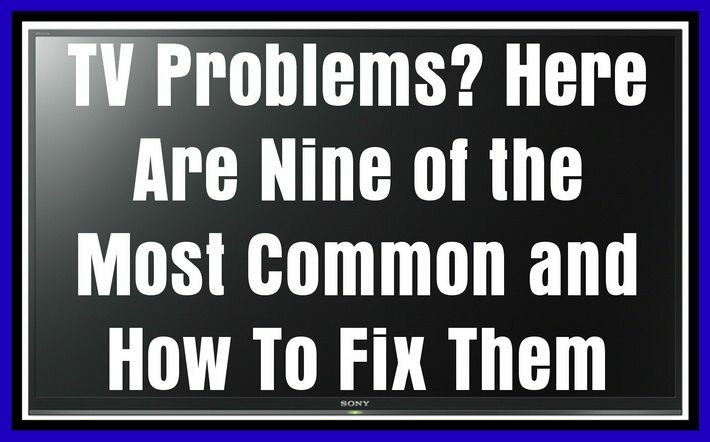 Is your flat screen HDTV giving you problems? Before you call up a TV repairman, you may be able to fix some of the most common problems yourself. Here are the most common – and how to fix them. 1. TV shows a blue, green, or black screen. Your television is not getting a signal. Make sure that your cable or satellite box (or other device) is powered on and that the TV is set to the correct input – press Input, Source or TV/Video on your remote control. Check behind the TV for loose connections. If none of this works and you are trying to watch live TV, then it is probably time to contact your cable or satellite provider. You may need to “reset” your receiver. If it is a DVD player, the problem may be the player. Also, the video cable may be damaged. 2. TV image is “breaking up” or showing pixelation. This is caused by a weak signal. In some cases, it can be the satellite signal between a live event and the television station (especially if you are watching live sports on the other side of the world). If it happens only when you attempt to watch HD, then it might be a compression artifact. In other words, this is a reception problem, not a problem with your TV. If it happens a lot, you can try reducing your sharpness setting. 3. TV will turn on from the remote, but not the cable or satellite box. The cable box is not talking to your TV properly. Make sure that this is an option (it isn’t with all receivers) and if it is, try turning the box off, unplugging it for 15 seconds (at least) and turning it back on again. 4. TV settings are messed up. Maybe your cat or your toddler got hold of the remote – but you have ended up with TV settings that are so far from what you want that you just want to reverse them. The quickest way can be to reset the TV back to factory settings. This varies by TV model – you should check the manufacturer’s website for instructions, but it generally involves pressing a specific combination of keys on the remote. 5. Captioning is on (or off) when you don’t want it. Turning closed captioning on and off varies according to your cable company. You will need to use their remote, usually the settings or menu button. Some remotes have a specific CC button. Check your provider’s website for specific instructions. 6. Cable or satellite receiver has frozen up. Your cable or satellite receiver, especially if it is also a DVR, is actually a pretty simple computer, and like any computer it can crash. The first thing to try is to turn it off, unplug it, wait at least 15 seconds and then turn it back on again. This is essentially “rebooting” your receiver. To help avoid crashes, make sure not to cover the heat vents on the receiver, as they are often caused by overheating. This is common with new TVs – and it means that your sharpness control is too high for the content you are receiving. In fact, some experts recommend turning sharpness down all the way to zero as it tends to aggravate any and all image source problems. 8. TV not properly showing 4K or other high resolutions. There are two problems here. First of all, if your new 4K TV looks excessively bright and colorful and has blurred details, the store probably put it in Vivid mode. Vivid mode is for in-store display. You want to reset it to, ideally, Movie/Cinema (or Game if you’re playing games). Another issue is that your AV receiver or anything else between the source and your TV needs to be HDMI 2.0a – or it simply does not support many kinds of 4K. 9. Picture is squashed, stretched or cropped. This is most often caused by something wrong in your picture size setting – also called zoom, wide, aspect ratio or picture. The best setting, in most cases, is Direct or Just-Fit, which tells your TV to just show the video as it receives it. If you have a DVD player or old game system, though, you want to set video to 4:3 – otherwise your TV will stretch it to the modern 16:9 ratio. If using a computer, turn off Overscan to avoid weird cropping. So, nine common problems with your television – and how to fix them. For more information about how to improve your TV – and your life – contact us below for more help using the comment form. Next post: Troubleshooting Your Refrigerator Compressor – Is Your Refrigerator Running?